The cyclist intends to go straight on. The cyclist is turning to her left. The cyclist is yielding right of way to you. The cyclist is preparing to stop. 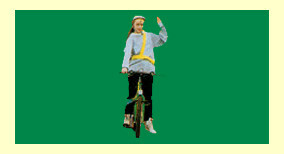 Explantion: This hand signal tells other road users that the cyclist intends to proceed straight ahead at a junction and drivers should show caution.